As soon as these lads are based, Royal Artillery will be able to field a two gun battery. More Zinnbrigade French Infantry conversions and yet another of my pointing officers. Next up will be some sappers, at least 1 stand, maybe 2. One of the downsides of relying heavily on homecasting is when I need to cast to keep painting and there is a lengthy spell of unfavorable weather so I can't cast in the woodshed and my wife is home so I can't cast in the house. One of the upsides is that when I cast, I usually end up casting more than I need so there is almost always a good supply of bits and spares. I wanted to start another battalion of British infantry, not yet cast but I also needed an 1839 Brigadier, so I dug into the spares. Amazing how few uniform books bother to deal with Brigadiers in detail but perseverance pays. British Brigadiers are another sticky point for Red vs Blue armies, esp when facing Americans. The most common uniform for generals on both sides was a dark blue peaked cap, dark blue frock coat and dark blue trousers. One has to look closely at the details of trim to figure out who is who. Luckily, I have seen enough pictures of British Generals wearing cocked hats with their frock coat that I felt comfortable going that route. 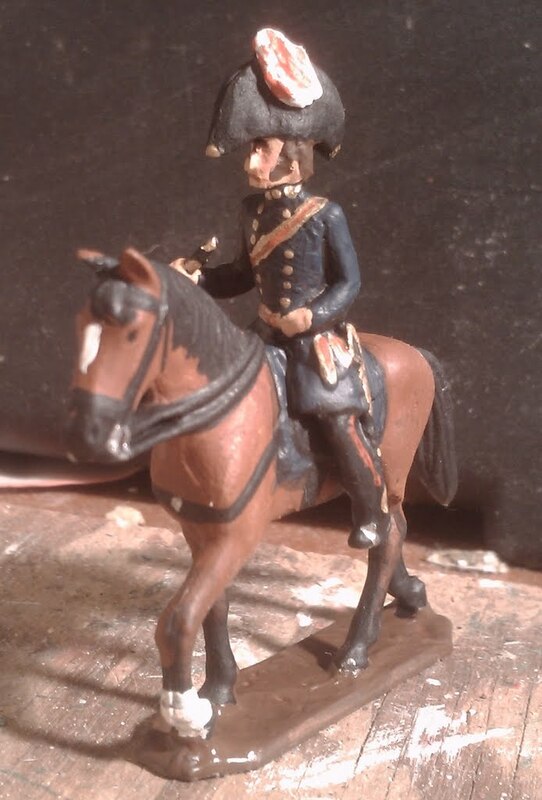 Body and horse from a Zinnbrigade Prussian Hussar with lance (since shortened to a telescope) with one of my heads replacing the fur busby, and some putty for coattails, sash and trousers. Base and gloss varnish to follow. Without further ado, may I present....Brigadier General S. Glasse. A Practical Solution or Subliminal Conditioning? The Royal Scots finally up to Battalion Strength and a Queen's Colour to boot! a) MacDuff with single figures in battalions of 3 or 4 companies each of an officer, sergeant and 6 or 10 bayonets, a frontage of 12"-16" on washers. b) Charge! with single figures in regiments of 3 companies each of an officer, drummer and 16 bayonets, a frontage of 27" on washers. c) Hearts of Tin with battalions of 3 stands with 6 figures per stand, a frontage of 180 which later became 5 stands of 4 on a 200mm frontage. The key considerations were looks, functionality wrt to game play and what would fit on my table (which was 5'x9'). Basically the choice would come down to unit frontage x number of units vs my table size and scenario design. If playing Grant Teasers, there is a lot to be said for being able to field sizeable wargame units 1 for one although this is not strictly necessary. Things had been coming together nicely with a choice of 5x4 man stand HofT units until the moment in 2009 when I realized that my planned armies were going to be too much for my eventual table and I went into free-fall mode. After many trials and dead ends which have been chronicled on this blog, I finally decided to settle on 3 stand HofT units with 6 figures per 2" wide base. Not all that different from one of the original options, just an inch or so smaller frontage. How about that, except that its a HofT Brigade and has a frontage of only 18" instead of 27" thanks to the multi-figure stands in place of washers! Somewhere in Scotland, 1547, The English have been moving to besiege a Scottish town but their heaviest siege gun has bogged down on the way. The Scots and their Auld Allies move to make sure it never gets there. While Rob & I are signed up to run two 16thC games at Huzzah, I had left the details somewhat sketchy. This morning I ran through one of the scenarios I am considering. I won't say too much about the scenario itself, partly for copyright issues, partly because it has occurred to me that it is possible that some potential players might be reading these posts and while I am happy to encourage readers to do so if they can make it or to at least step by and say "hi", I don't want to give away too many thoughts on what strategy worked, what didn't and what might have. So I'll just say that the game took about the right amount of time for a convention, especially where players won't know the rules, that I think there was just about enough for each player to do, but maybe room for just a few more troops, and that the game was once again close and hung in the balance until the final scheduled turn. In other words, it looks like a good candidate for me so I'll see what Rob agrees. Note how the Scots, familiar with the area are hanging about on dry ground while the English and various foreign mercenaries are floundering in the marsh and thumping each other? Its been a couple of years now since Rough Wooing has had a public outing. Its well known that I'm dangerous when left on my own with a set of rules and a bunch of toy soldiers but at least in this case, I have Rob, the co-author, as a check of sorts. Its tricky getting the right balance between making the rules fast playing, decisive and simple enough for new players to pick up at a convention while still having enough flavour to represent the period and having enough meat to make a game satisfying. 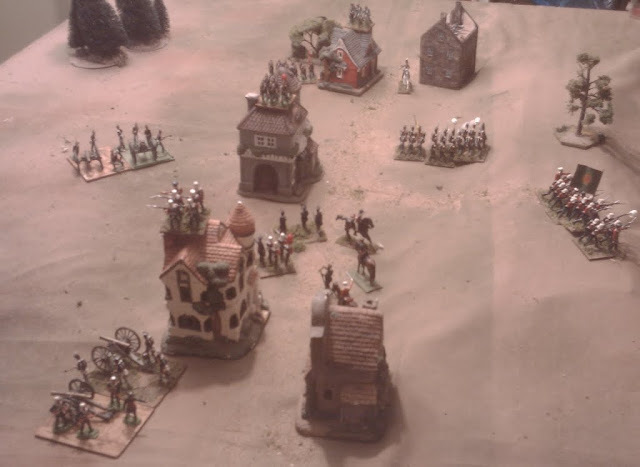 Many of the games played in between conventions are small affairs focusing on cavalry and light troops and I sometimes lose sight of the difference in the game once the table starts filling up and the number of players, especially new players, grows. The core rules are fine, maybe they could use more nuances but I think they do what needs to be done. The command rules for subordinate commanders can be frustrating but I usually don't make players roll if an out of command subordinate commander represents themselves, only for non-player commanders. The main issue I had today was logistics. This is going to sound familiar but tracking hits by stand is a good idea in theory, especially since there are no fixed units, only temporary groups, but its a pain in the donkey when there are even 50 or 60 stands on the table, each of which can take 3 hits. By turn two I was back to just tracking them by group and taking off stands when enough had been accumulated. As the day closes, the last 4 stands of English foot see off the last of the French cavalry and their German lackeys. Every body else gave up and went home the turn before. The empty battlefield syndrome cropped up again during the last 2 turns but having a Battle break and leave the table when it has lost over 1/2 its stands is easy to manage and several proposed alternate rules have caused their own problems so I'm ok with it. (Its amazing what offensive uses players will find for troops who aren't allowed to shoot or charge or move towards the enemy) I'm not so ok with our apparently not having decided, or at least not having written down, when such a determination is made, right away? when activated? at the end of a turn? A minor issue but it will have to be discussed and decided. Following on to my last post, here is the newest Rebel Brigadier in the Army of the Annapaloosa. Soldiers like to nickname Generals. General Kinch is widely known as "Ol' Smokey". His brother in Federal Service is known as Smokey the Bear. The body used for this conversion is probably familiar to anyone who war gamed or played with toy soldiers in the 70's. The head, sword and horse are from Italeri. Its interesting that with the naked eye, I can see the pipe but can hardly see the smoke while for the camera, it is the other way around. My Reb army was hard hit in their last game, and I decided that I needed to reinforce them before starting a mini-campaign. It was at this point that a parcel arrived in the mail. A little while ago, I received an email from author, blogger, dilettante and gamer extraordinaire, Mr C Kinch, esq. Having noticed my slowly growing collection on 1/72nd ACW, he offered to send me some figures that he had bought for a lapsed project. I was expecting more raw material, maybe a few primed figures etc so imagine my surprise yesterday when not only did 2 Brigades of infantry, a regiment of cavalry and some pioneers and gunners show up, but a brigade's worth of Reb's were already painted. All they needed was a quick touch up here and there but I gave them a series of quick washes to help them blend in with my troops, rebased from their single to my 40mm wide bases for HofT.... and.... Voila!. Two hours work this morning and my Confederate armies are now on an even footing with my Union forces with 12 regiments apiece. I just need to flock and and add a mounted officer and flag before sending Kinch's Irish Brigade into action. I foresee an ACW mini-campaign beginning this week. A big THANK YOU to Conrad for his generosity. A Four Horse Power Engine is it? Oddly enough, one of the very first pieces I recruited for a fictional mid-19thC wargame, was the Mary Jane, a steam tractor and one of the first scenarios I planned was an attempt to rescue her. At the time it was going to be a MacDuff skirmish with companies not battalions and I never got to stage the game but here we are, I've played a rescue now! I'm afraid that you'll have to pick up a copy of Battlegames #28 to get the full scenario details but you'll get to see my pictures and report on a French & Indian Wars scenario as well. 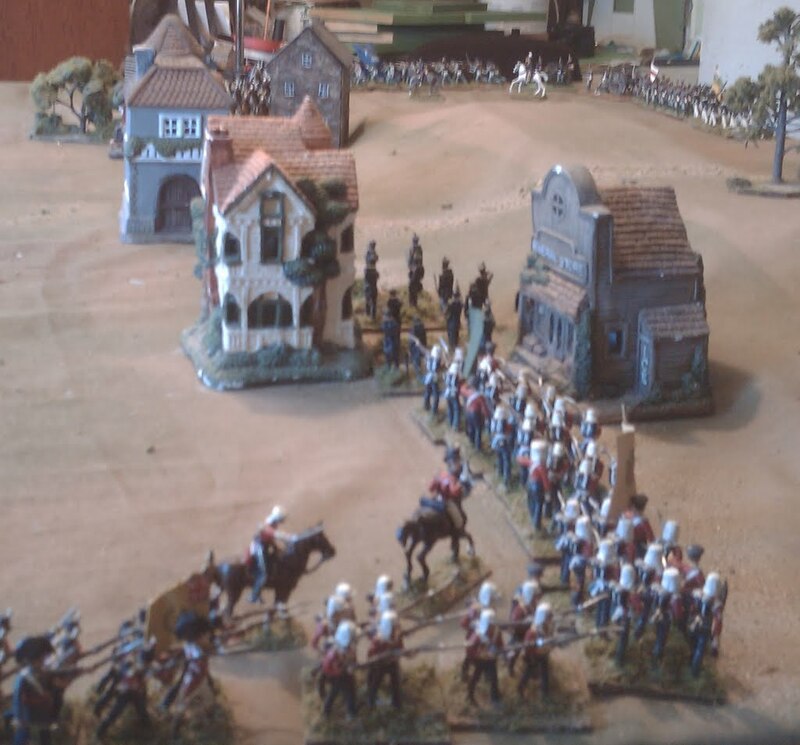 The climax of the battle, the Blue Dragoons have charged a converged Grenadier battalion in square. Despite the best efforts of the Grenadiers, the square holds. Just. After 3 days of typical Nova Scotia mid-summer weather, which just happened to have arrived in March which is usually considered part of Winter here, I was tired from unseasonal yardwork and might have been better sitting with a book but I decided to get the table set up. Then I decided to roll a few dice. Then a few more. Red had a solid plan but I'm not sure Blue had a real clear picture of what needed to be done till about 2/3rd of the way through the game when he seemed to come alive. or maybe it was the after dinner coffee kicking in. This was another one of these games where Red was pretty much cooked and eaten for dinner by Turn 4, Blue was washed up and hung out to dry by turn 6 and victory hung in the balance on turn 9 of a 10 turn game with a desperate final charge being repulsed all along the line but real victory or defeat lying in one last even odds cavalry charge. So what about the main reason for playing? On turn 3 I started to fret that the Rally numbers were wrong but by turn 6 it was plain that they were just right. A delicate balance of hit numbers and rally numbers gave just the right balance to the game. You can't count on any one volley or rally going one way or the other but you can be reasonably sure that in large masses the fight will be prolonged before one side crumbles, usually. Every now and then there is just a chance that things will go pear shaped so you can't really relax. But on the other hand, on 3 separate occasions during the game, cavalry units defeated in melee and shaken were perched on the edge of the table needing to roll at least one 6 out of 2 dice to avoid routing off table, and made it! So you can't count units out until they're out either. So there's one game with no changes, two really since it was just an oversight/typo correction after the last game but I'll be strict and count one. About 1/2 way through the game, it occurred to me that I have some 1812 casualty figures so I began substituting these for the dunce caps and they worked well, easy to track and slightly more photogenic if more gruesome. I seem to recall people using printed out 2d markers but since I have all the home casting gear spitting out 2 dozen generic red and blue casualties should be easy. I'm still not quite sure what to use the lose drummers for, perhaps to indicate units that MUST rally. As for the organization change, I hate to admit it, but it worked fine. The cavalry and light infantry are big enough to be dangerous and small enough to be both mobile and fragile. The line infantry are robust enough without being too tough meaning a decision is possible in a reasonable time. When I tried 3 x 3" stand cavalry/light infantry, they were just too unwieldy while the 24 man, 4 stand infantry units may look good but at 8" per unit, they eat up just a little bit too much table space on my little table. Three stands don't make as neat a square or attack column but my guys mostly fight in line anyway and I can live with that. I'll leave the fourth stand on units like the Blue Guards for those cases when I want some larger, non-standard units for some scenario and field the rest as 3 stand units. I'll have a few spare cavalry in a couple of the units and will have to decide which to build up into a 2nd squadron and which to place in reserve. But in Atlantica, all new units will be raised to this standard: Line infantry, 3 stands or light infantry/cavalry/guns, 2 stands. Its definitely time to start trying out some Henry VIII scenarios for Huzzah. I want something a little different than a head on bash if I can but first I want to get in at least one more game of Hearts of Tin while my mind is still on it. Especially before turning to Rough Wooing which is similar enough to confuse me. I wanted something a little bit larger with a few more infantry. Apart from any rules issues, I'm still wondering if 3 stand infantry units wouldn't fit better and be better for scenario balance. That would also give all of my units a 6" frontage, not that that really matters. Anyway, I was flipping through Stuart Asquith's Solo Wargaming book when my eye fell on the latest Battlegames. I vaguely recalled seeing a Napleonic scenario by that young Kinch fellow which I had put aside for later. I also recalled my original intention of playing all of the Battlegames scenarios. So, I broke it out. There we are, C&C Napoleonics unhuh, and those lovely 20mm armies, yup, ok and HENRY VIII?! EH!? hmm this might actually do for Rough Wooing quite nicely! I got the table set and was laying out some Demi-lances and Border Horse when I remembered the objective. OK then, something for the weekend. I was planning to do a 2nd ACW game but Lentulus asked if the changes would suit my 40mm armies. I was pretty sure they would, after all, apart from a few details of wording, the rules are essentially the same as the pre-2012 rules except that the retreat for what I'm now calling Shaken units is automatic instead of a risk on the orders chart. However, it seemed wise to verify that before I went farther. I decided that I may as well test a small game to see if the bottom end was going to cause me issues. I wasn't too happy last year when one small game took twice to set than it did to play so out of curiosity I timed both. From the time I flipped open Scenarios for Wargames to choose something until the table was set and armies deployed took me 20 minutes. Since there is less fiddling and fewer choices made when cleaning up, I think 10 minutes will suffice for that. 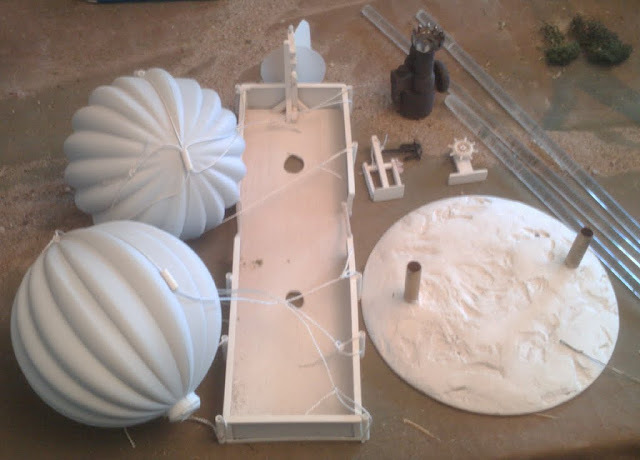 Mind you it is one of the simplest terrain layouts in the book. The game itself took 90 minutes to play 12 turns to a decisive finish. The scenario (Dominant Hill) is a simple meeting engagement with 7 units a side so is right down there amongst the simplest, shortest games. I would consider an hour to be the minimum satisfying length so this passes on all these measurable bits. The forces of Oberhilse and Faraway meet in the shadow of Long Hill during one of the largely unrecorded border campaigns. For convenience I wrapped the road columns along the table edge so please imagine the troops marching along the edge to be off table. The scenario is very straight forward, there is a critical road junction between a road passing through a series of small towns and a road leading over a difficult hill. Both armies are tasked with controlling the road junction and the road over the hill. They are given a list from which to pick 7 units which they must arrange in order of march. I decided to only pick units on the new basing where possible which speeded up army selection tremendously. Brigadier Zinn was given command of the Oberhilse force which consisted of a Brigade of 2 squadrons of Dragoons, a battery of field guns and a brigade of 4 infantry regiments including the Blue Guard. Brigadier Topper commanded the Queen's forces, a squadron of the Princess Charlotte Dragoons, a battery of field guns, a Brigade of 2 detachments of the Victoria Rifles and a Brigade of 3 regiments of infantry. The Blue army had 22 stands giving them an army morale of 8. The Red army had 20 stands giving them an army morale of 7. The Queen's men moved first for the opening moves allowing the Rifles to occupy the mansion at the junction and the hill. They then surrendered the initiative for the rest of the game. Brigadier Zinn, realizing that he had a force that was 1/3rd cavalry and without light infantry to capture a town and difficult hill, deployed his guns and cavalry in the open and occupied the nearest village while he considered his options. Somewhere around turn 5. One of the many nice things about the fixed bases is that they allow me to "occupy" my ceramic houses which means I won't need to replace them. The men may look a little silly perched on the roof but they get a good view from up there and don't fall off like singles did. Zinn's initial plan was to threaten an infantry assault up the middle while the cavalry and artillery swept away the Queen's artillery and cavalry and threatened the flank and rear of her army. This went somewhat awry when some lucky rifle and artillery fire silenced the battery as it deployed. The gunners, obviously badly shaken were headed home when Zinn caught up with them at the board's edge and by his +1 alone rallied 1 gun keeping them on the table. While he was chasing the guns, he left the 1st Infantry to launch an attack. It promptly took 3 hits and fell back before something worse happened. Things weren't going well. 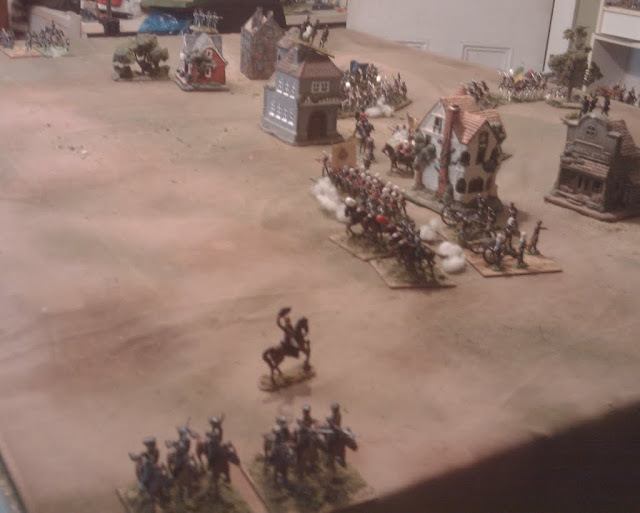 Across the table, the Queen's troops were feeling pretty smug until Brigadier Wavey decided that there was no sense sitting under artillery fire any longer and advanced. The PC Dragoons spurred forward to meet them, with an added bonus of being uphill. They must have been celebrating their recent promotion to Elite a little too vigorously last night though and they were chased off table by the Blue Dragoons who didn't even break stride. At the same time the Lafayette County Rifles pushed forward along the hill with the bayonet and contrary to expectations, routed the Rifles who had stood to meet them. All of a sudden Red's Army morale was down to 3 and their guns were next in line for the Blue Dragoons. The Queen's artillery stands firm. The 2nd Squadron of Blue Dragoons wheeled and charged the Red guns which had limbered up and headed for a safer spot. These had just time to unlimber while the Buffs fired into the cavalry as they rode past. There was no time for the guns to fire until the dragoons were upon them but blast of a point blank canister was enough to send the Dragoons to the right about. (ie they scored a hit in melee and the Dragoons didn't). For now the situation was stabilized. In the center there was nothing for it, the day would have to be decided by the infantry going toe to toe. The Blue Guards came forward and were hit by a devastating volley of musket fire supplemented by rifle fire from the Mansion. The remaining 3 stands reeled back while the 1st Infantry came forward again. After another furious exchange of volleys, the Green Tigers were starting to waver so Brigadier Stoneforte pulled them back behind the Uniake Fusiliers. The Lafayette boys held the road over the hill, the infantry fight in the center was in the balance, the artillery was back on line, it seemed like the time to push the issue. The cavalry once again charged the guns and were sent reeling, shaken. The Blue Guards somewhat rallied, stormed forward against the mansion at the crossroads. Both sides fought furiously and at the end of the day the Rifles were eliminated, though their Colonel escaped capture, but the guards had been shaken again. Leaving 1 company to hold the Mansion, they fell back. Across the road, the Uniake Fusiliers pressed forward with the bayonet routing the 1st Infantry while the Tigers wheeled to face the Lafeyettes and in a furious firefight, drove them off the hill, following to make sure they didn't rally. If Red could just flip the initiative they could finish this but once again Blue won the toss. He rolled to rally the Guards, and also the 1st Infantry, Lafayette Volunteers and the Blue Dragoons. These last three were all shaken and perched at the table edge. All 7 stands failed their rally roll and retreated off table. The 2nd infantry, knowing that the enemy had been hard hit, threw caution to the wind and charged with the bayonet, hoping to rout the Uniakes and draw the battle. They charged hard and rocked the Fusiliers back but these held firm and shot them down. Brigadier Zinn was forced to recall the Blue Guards, artillery and remaining Dragoons and fall back to report his failure to seize the road junction. On turn 10 the Army Morale's were at Faraway 2, Oberhilse 6. Two turns later the count was Faraway 1, Oberhilse 0 (-3 actually!). A game full of swings of fortune largely due to choices. At the end of Turn 12, 1/2 the Oberhilse army retreated off table leaving the Queen's troops bloodied and dazed but victorious. So much for the battle, how did the rules fare? The main reason I had started fiddling with the rules last year was that I wanted to use single figures and made the error of trying to adapt HofT instead of focusing on MacDuff which was designed for singles. This desire for singles had nothing to do with HofT, just something that I needed to get out of my system one way or another. So it comes as no surprise to me that taking the core rules back to what had been working with 3-4 stand units should work again. Having just looked back through some archive versions, the biggest changes are that the control check has been simplified with less chance of units stalling though they still do it often enough, and that the rule for dealing with "1/2 strength" units now seems to work like intended/envisaged. Looking back, I have to say that the greatest progress in the rules has come from letting go of two fears, fear of not showing historical detail and fear of results being too chunky,or drastic and unpredictable. So did I change anything? Well, of course! I hadn't considered that my houses only hold 1 stand and these are by definition detachments and therefore treated as units. This in turn meant that any stray hit on any house would cause its garrison to be shaken and evacuate. So on turn 3, I added a rider that infantry in square or garrison and artillery in forts aren't forced to retreat when shaken. They'll stand and die in place if their general asks it. This in turn means that I'll have to retract the new rule on taking a panic test if infantry in square are defeated by cavalry as it won't work.I'll go back to just fighting another round. The various other changes make it less likely that a couple of lucky rolls will break the square so this should mean that it is difficult but possible. I guess a solo play through of the convention game is now needed but I want to paint some more figures first so it'll be back to the ACW for the next HofT test but testing a Rough Wooing convention scenario may come first. The NEW, IMPROVED? 6th Edition is now available from the link at left. The QRS is in the shop for repairs but will be back soon. while some wise acre sings " Jeff Davis, had only one left...."
This game was being played primarily to test out various rule ideas. (see previous post for layout and forces) I started off by trying having each hit causing disorder on 1 stand. A second disorder would remove a stand. Disorder caused a -1 to shooting and melee rolls. Unit morale would adjust the rally roll. The first game got off to a slap bam start with the Reb artillery hitting both Federal guns then infantry hitting them with rifle fire. I'm not sure if anyone got to try making a rally roll. By the end of turn 2 the first Reb brigade was decimated and I decided to start again. For game 2, I tried the proposed system of disordering a stand for every 2 hits for regular units with rallies being 1 die per disordered stand needed 4,5,6 to recover, -1 if having fought etc. That worked a little bit better but it was very tiresome dividing hits, dropping fractions, figuring out how to split fire etc and I noticed a lack of results, the firefight went on and on. Game 3, The Reb gunners pour in fire and cheer on the PBI. After a break for some chores, chow and a ponder, a dim bulb came on, somewhere in the deep recesses. The second issue resolved around the 2 hits on a 6 which is why there were so many hits first time around and therefore why I was having to halve them now . Now I rather liked the 6 thing but I brought it in last year when I was playing with single figures and it has caused me some grief already. Its also a pain to try to instill the score into new players, like at a convention. Now that I'm back to stands and not basing any results on 25% like I tried, its not really needed. So, I dropped it and went back to a hit is a hit. But, I figured that as long as I was going back I might as well go all the way back to the Morchauser's basic 5,6 is a hit which I used for the first 8 years (with modifiers for range, cover etc). This increases to 4,5,6 in melee making it more deadly than shooting. This in turn meant a return to morale being used to modify rally rolls. The Reb High Water mark. Taken together, things started to click and the game took some shape and became more engaging. The dice were as annoying as ever when seeking a decision with volleys which might have finished an enemy coming up all 1's and 2's while a last desperate stand produces boxcars. However, while the Rebs came close to sealing off the bridgehead, they couldn't quite do it and after repulsing a mounted charge, the Yankees started working around their flank. As the Rebs started having to pull back to refuse their flank, the hits mounted faster than they could be rallied and regiment after regiment became Shaken and started heading for the rear. (I brought back the term on the fly applying it to the new status of all stands disordered). I was about to call the game when finally the Rebs got a double move and made some rally rolls. A new line started to form. The hope was short lived. As one battery pulled back to find a safer position, the other was silenced (shaken) by rifle fire and forced to retreat. The imaginary limbers were about to tip over the edge when they finally rallied but as a second firefight raged on the plain below the Reb line broke again and the army hit its break point (now lowered to 1/3 losses), largely due to shaken units retreating off board. The army had been pretty much forced back past the exit they were trying to protect anyways so nearly a moot point. As I started to run out of hit markers near the end and surveyed the field and all the markers, that light bulb pulsed again. Now that I had dropped the new 2 hits on a 6 rule, I didn't really need to -1 to disordered stands, in fact, I didn't need to know which stands had hits I only had to track hits vs the unit. Luckily I now had a term for having all stands disordered, it was easy to rephrase it, when a unit becomes shaken each subsequent hit removes a stand, just like when I was tracking a break point. The difference is that point is now 3 or 4 not 8 or 12. Because hits are rarer, the over all effect is the same with less bother. People can use a small die or counter to track hits or casualty figures or caps on stands, whatever they like. So once again, another step back closer to the original game. A 6th version of the draft has been uploaded. There were some collateral damage to other rules, I think I caught them but it would be surprising if I didn't miss anything. the QRS has not been updated yet. I think the next test will be a Grant TT Teaser or Scenario. Due to the delicate nature of the bridge. Only 1 regiment can cross per turn. The earthworks are hasty in nature and count as cover not fortifications. Federal Victory requires them to clear a road exit. Confederate victory requires elimination of the bridgehead. Any other result will be a stalemate. and the first thoughts of a new day. 1. Each unit has a morale value, this being what was used last year: Militia 1, Regulars 2, Elites 3. 2. Whenever a unit or group takes hits, for each multiple of its morale one stand is disordered. (this is going to be harder to explain than it will be to do, essentially dividing hits by the morale and dropping fractions). Remainders are dropped not tracked. A disordered stand will have to be marked in some fashion, a bead, a cap, a small marker die, turn it around, put a casualty behind it etc. 3. If all the stands in a unit/group are disordered, each subsequent disorder will force the permanent removal of a stand. 4. When a unit rallies, a successful roll will remove 1 disorder marker. 5. A disordered stand is -1 for shooting and melee. I think I'll start with the ACW. Last thoughts for the day. I had time to play about with some of the ideas and to clarify the issue. a) Any method adopted has to be able handle units of any size. (eg normal units are 3 or 4 stands but they may be 5 or 2 or even a single stand. 4x1 stand units should not have an edge on 1x4 stand unit. c) I don't want to lose the feel of the rules. d) I want to be able to rationalize any drastic departures from history. B. Break Point. The 2nd option was to go back to the break point idea with no stands lost until the break point was reached. I had some issues with this, especially for 1 stand units but essentially it worked. This very similar to what I played for the last games but without the flucutations. Once the big red dot goes down, the unit is doomed. When a unit is shot at, divide hits by target morale (2 for regulars), drop fractions. the result is the number of stands "lost". "Lost" stands may be removed (not historical but very traditional) or may be just marked (closer). Agree on this before a game. Remainders are not carried over. When a unit rallies, a successful rally roll will bring back 1/2 of the lost stands, rounding down as long as at least 1 stand is active on table. If all stands are lost then the unit retreats off table/routs etc as appropriate. Needs more work and some proper testing but it might avoid excess makers without changing everything. Its official. For a guy who likes to play with toy soldiers, I think too much. Firstly thank you to all who have commented so far, There have already been some very interesting and useful comments and no useless ones. I'll try to get to individual responses later. To everyone else, keep 'em coming. The difficulty of linking or separating the moral and physical aspects are as difficult when writing wargame rules as they are when dealing with day to day life. I was thinking I had that squared away but it appears that I don't really. For one thing, if hits are as much about cohesion as anything, what does the size of the unit have to do with it? While thinking about things like dicing to separate physical from moral hits and dicing to convert hits to stand loss or dropping them, I decided I needed to refresh myself on actual casualty figures, something I have to do periodically because the information seems to get lost in my head. Obviously not a thorough study but a very quick check of a couple of easily reached books with casualty figures for about a dozen battles, a mix of the Peninsula, War of 1812, Sikh War, Mexican American War and American Civil War. Typical unit casualties seem to be between 10% and 20% with anything over 15% being considered heavy or very heavy. Individual units that suffered as much as 25% generally suffered some disaster at close quarters. Unfortunately, none of battles looked at included any units that had been wiped out or routed off the field and I didn't come across figures for any armies that routed off the field though estimates of Sikh losses pojt towards 50% probably more stragglers than dead and wounded. So, if my standard units are 2,3 or 4 stands, rates of 10% and 15% don't argue well for stand removal even if you swell it by stragglers,those helping wounded, or shell shocked, etc but dragging a growing trail of hits around doesn't make sense either. This was starting to sound frighteningly like a complete rewrite from scratch, perhaps to something like the portable wargame or something with a boardgame like crt with defender retreat or something, so I broke for tea before I got crazy and spoiled something I like. 3) try to be more creative and try to make things easy and engaging without being quite so dramatically and obviously wrong, but also without changing the current shooting and melee rules. A slow drain of casualties from skirmishers, artillery and long range volleys. This seems to weaken a unit's resolve when the real attack comes but it seems rare to find a unit driven back let alone routed by this kind of fire alone. Sudden, heavy casualties from a close range firefight or canister. This can repel an attack or force a defender to retreat or even rout though usually the bayonet or some cavalry are needed to finish that off.. This is where I used to like Morschauser's 3" 'melee' zone since it caught that difference. It just didn't differentiate between charges and close range firefights. So what if a unit, regardless of size, had a morale of, lets say 2 for regulars which was the number of hits required to remove a stand all of last year (1 for militia, 3 for elites) This number of hits might disorder a unit. Hits would not be accumulated, they either disorder or they don't. It follows that a single stand unit can only disorder a regular unit if it has no negative modifiers or is part of a group. To prevent a group of small units being more effective than one large unit, all hits against a group would count against each unit, disordering or not vs its morale. Disorder would remain until a successful rally. If a disordered unit received a 2nd disorder result, it would be forced back a full move, perhaps losing a stand as an easy way to mark a permanent reduction in cohesion. If preferred, the stand could be marked as shaken rather than removed. Similarly, a unit defeated in melee would lose a stand if enough hits were inflicted. (for example a unit moves up to attack a battery of 2 guns and the enemy rolls boxcars for shooting. The unit receives 4 hits, goes disordered, loses a stand and retreats a full move. If it had only received 2 or 3 hits it would just be disordered, if receiving 1or 0, it would be OK.
What would disorder do? Like the current "defeated" status which it would replace, the only order allowed would be retreat or rally. -1 to all shooting and melee dice while disordered. What about 2 units mutually disordering and driving the other back? I can't think of any historical precedent, perhaps no shooting should be simultaneous? A priority would be needed, stationary first, then moving second? I think I need to test this, looks too simple, there must be a catch. It occurred to me last night that one of the many benefits of having a live opponent for testing both rules and a scenario is that my attitude or approach to a game seems to change. I become more emotionally engaged and it seems this has an effect on my intellectual appreciation of things. The particular trigger for this thought was a contemplation as to whether I had been right to veer away from removing stands as soon as a unit suffered enough hits and going back to allowing the unit to store up hits. The see saw between these two approaches has been going on for at least 10 years. 1) unit frontages should not shrink as fast as they do when stands are removed. Partially this is because most hits are not physical casualties and partially because units tried to maintain their frontage to avoid being flanked, pushing rear ranks forward, increasing gaps between sub units etc. 2) it allows units to reach a break point and suddenly collapse as is sometimes seen in history. 1) Its relatively complex to track as hits go up and down and as stands come off. Not incredibly so but its not instinctive. It also requires markers that can count as high as 12. 2) sudden unit collapses were not all that common whereas this system makes them routine, in part because having a little marker beside a unit doesn't often seem to affect how a player uses it, especially if they are not a veteran of the rules. 3)it lacks the emotional punch of removing stands as your unit comes under fire. I hate to even mention this but the difficulty almost disappears when I tried using single figures because I was removing casualties from the back rank so the frontage was maintained but you still had the impact from removing (or knocking over) figures. There are more than enough reasons why the singles did not work for me overall so this is pretty irrelevant. 4) need to change the rally rules. I thought about rallying stands but I think not, it might do to allow units to remove 1/2 hits rallying up instead of down so that a single hit can be recovered. The effect of the support unit might then be switched to an attempt to recover lost stands, making them something special rather than a modifier. The point to all this is that I am asking for input, especially for those who have played the game but also from anyone who can imagine showing up at a convention and playing the game without ever having read them. Comments welcome but I'll post a poll as well. I was fortunate enough to have Lentullus drop by today and play the revised Neverwaussie scenario that I'm planning to take to Huzzah. As mentioned after the game with George I decided to turn the layout sideways. I decided not to reduce my unit sizes like I did that time though. Doing so made the frontages more correct for typically understrength North American units and gave them more elbow room but I like the look of the larger units, its how I'm painting them and having fewer units seems to make it easier for new players to identify with them and "get into" the game and makes the units more resilient. It also makes the loss of a unit more dramatic. Instead of dicing for arrivals, I reduced the on board force and allowed the Americans to plan their own order of march with 1 unit arriving per turn. I started with 1/2 the British deployed on table and the rest able to enter as desired. Random selection left Les defending and me attacking. The airship still isn't ready so the HMS Reuse came out again. The first shot is from around Turn 5. All of the British are on table and about 1/2 the Americans. The Observation balloon has gone up on the table edge which was silly of me. The General spent the next few turns too far away to benefit from it. The Reuse has dropped off the landing party and withdrawn and work is about to start on the pontoon bridge. In the background, the Lafayette County Rifles have fallen back from the first fence line with the British hot on their heels. While the infantry fought over the fields, the opposing cavalry dueled. The Hussars won the first round but declined to pursue as they were beyond their supports. Once that support was up, they charged in turn and again won but this time they pursued, hit the 2nd Squadron of US Dragoons and were destroyed and their brigadier captured. Oops. The British Dragoon Guards made way for the guns and a combination of rifle and artillery fire started taking it toll. When the Lafayette boys finally broke the Dragoons headed for the bridge but not fast enough. A parting volley from the Fencibles dispersed the 2nd Squadron. Across the river, American reserves had been rushed forward to deal with the pontoon bridge. The landing party, thinking more of self preservation than of screening the sappers, had advanced and occupied a small farm. A company of Volunteer Rifles slipped through a gap and opened fire on the sappers as the 2nd pontoon was launched. The Sailors fell back and started working around to drive off the riflemen but it was too late. The Sappers needed 3 more work points to finish the bridge, they rolled 2 and then the riflemen let loose with boxcars. There would be no pontoon bridge. By now the last American units were arriving. As you can see, the Steam battery has been upgraded closer to my original vision. At this point both armies had suffered heavy losses and time was running on. Only one way across the river remained, the original bridge. As a fierce cross river firefight raged between the Victoria Rifles and some local Volunteers, the Royals formed up ready to charge over the bridge. Just before they went forward, the steam battery pulled up at the foot of the bridge. The Royals stormed forward, taking horrible losses due to their being a Dense target. They persevered though and at the last moment the crew of the battery flinched and they were over run. Before the Royals could rally, the first foot moved up, blasted them and then charged dispersing the remains of the regiment. Once again the British brought up their guns and riflemen, then, forming a Squadron column, the Dragoon Guards charged forward into the battered 2nd Infantry line. These steady veterans stood form, shot the cavalry out of the saddle and sent them to the right about. At this point the American Army Morale had fallen to 1 while the British were at 7 but night was coming on (i.e. time was up). The bridge had been held. There were some interesting points raised by this play test but I'm quite satisfied that this will provide a good convention game for up to 6 players. If the table is no bigger than mine, I may need to make the edging hills even narrower and there needs to be just a little more room on the US side between the bridge and the table edge. I might also hurry up the American reinforcements to make sure all players have enough to do. Just out of interest we played about 13 turns in about 3 1/2 hours which is about the amount of time I'll have at the convention. Since each turn theoretically represents an average of 15 minutes, this means we played in close to real time. Having the sappers shot down was interesting. That's what the landing party was supposed to prevent but they were too weak. Once again though the bridge took a long time to build. I need to decide if the bridge building is a main part of the game with a successful bridge conveying victory, in which case this all works fine or if the bridge laying is just a preliminary and capturing the road exit is the only victory in which case I should either deploy 2 sapper companies or drop the bridge from being 3 sections down to 2 sections. We found one or 2 situations that were not well defined in the rules but that's what a GM is for. The change to allow any troops to benefit from enfilading a target etc made a big difference tactically. Anyway, no rule changes!! Tomorrow I go back to casting and painting and also start thinking about the two 16C Rough Wooing games that Rob and I will be hosting. The first almost complete casts are out of the latest mold, a US militiaman in smock and round hat and a sailor. Not the best job I've ever done turning a master into castings but not the worst either since it looks like they are usable even if needing to be replaced. After 30 minutes of testing and venting I have a produced a couple of almost complete castings but each will require about 5 minutes work to clean them up never mind lost detail, (in addition to the detail lost to the lighting) no bayonets, missing chunks of hat brim, etc. At least they have arms now! The sailor is open handed and can take a musket or artillery implements or just run around crewing things. I was wondering how many people would question the ability of the wagon to survive having the mortar fire. (1.5 so far is the latest count I think **** This comment is not intended to imply that anyone has been in the slightest negative or less than positive and supporting, Just the opposite in fact***) I'm sure there must be a steam punk explanation, some sort of steam-hydraulic shock absorber thing mounted underneath where you can't see it, but on the other hand it belatedly occurred to me that I could probably turn spare 25mm barrels into 40mm swivel guns which is more what I envisaged originally. That would also answer the question of what the sockets are for. There were lots of more important things to do today than convert a wagon into a steam propelled mortar battery. A dollar store cowboy wagon with new wheels and scraps of this and that. The new Zinnbrigade crew will eventually wear smocks and peaked caps. 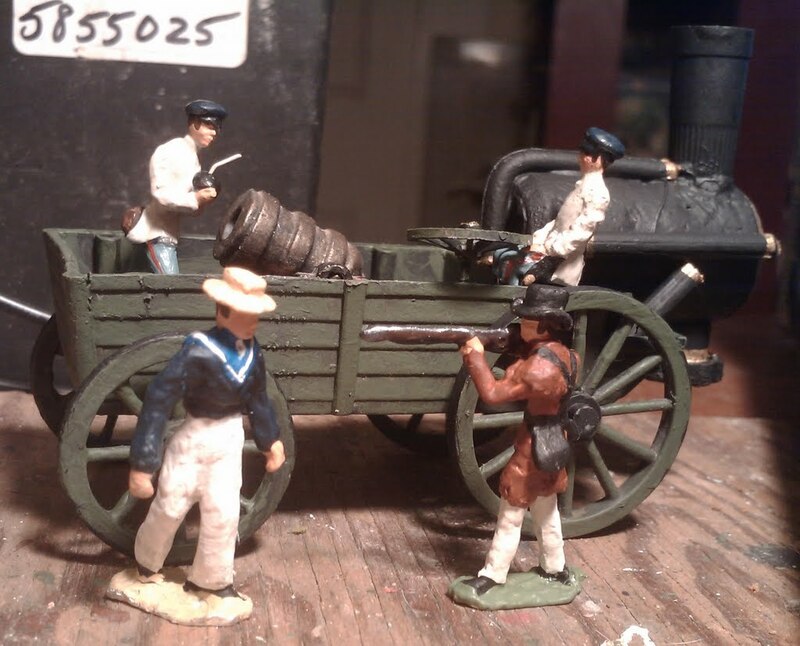 I originally planned to armour this thing and arm it with a light gun but while 1839 puts it after the first commercial steam driven off road vehicles, I think its too early for steel plating and even a light gun was presenting me with theoretical issues around recoil and muzzle loading without going outside the wagon (no room for "running in"). Some experimentation led me to try the mortar and it made sense. Field guns are mobile enough as is, the steam propulsion wouldn't help much but mortars are awkward to transport and there are naval Bomb Ketches to provide an example. I'll need to lighten the olive green wagon body I think and add some detailing and hopefully some brass. Infantry: 4 bases each 2"x2" with 6 figures (in theory, some bases are short a figure). Some battalions have one stand split in half with 2 figures on each half so that they can detach skirmishers. Light Infantry: 2 bases each 3" x 2" with 3 skirmishers or 4 militia. This is for small detachments that will not form in close order. Cavalry: 2 bases each 3" x 2" with 3 cavalry. This should be 2 small squadrons at 1"=25 yds but could be right for 1 large squadron at 1"=20 yards so I'm going to call it a squadron. This means my largest cavaklry force will be 6 squadrons so I'll do 2 instead of 4 per regiment.. Artillery: 2 bases each 3"x4" with a gun and crew. Often deployed as single guns. This is obviously quite different from my 1/72nd basing & organization but the good thing is, almost anything works! For teasers I need to experiment but am leaning towards each of these being a scenario "unit" with a gun = a gun. This gives me light infantry with 1/2 the bases rather than 1/2 the number of men but I think the effect will be about right, maybe. Tomorrow I need to clear the table and reset. Just a quick post to announce that a Quick Reference Sheet is now available for Hearts of Tin thanks to the good work of The Blue Bear of Saxe Bearstein himself. I took the liberty to update it with the very latest tweaks, then thanks to the magic of find/replace I converted a copy to inches at 1"=25 yards and did another for skirmish games in case I do another. They are all loaded into 1 doc, just print the page that suits you. Not only has Jeff saved me the work of putting one together, any changes will now have to be made in 4 places which means they can't be done lightly!! or the Template is decided and some bases have been cut. It was nip and tuck, but after some experiments with various numbers of figures on various sizes of bases with an eye to looks and how they operate under the rules, how they interface with the terrain that I have and plan to build, how easy they will be for strangers to figure out etc........ I have settled on a standard that I am happy with. 2" wide bases for everyone with light infantry being split in 1/2 to give them a 4" frontage when skirmishing, and artillery mounted on a double wide/double deep base and counting as 2 units. (becuase a gun and crew take up a lot of room. 2" wide for line infantry with light companies being split, 3" wide for everyone else with 1 gun & crew, 3-4 light infantry skirmish types, 6-8 native spearmen or 3 cavalry. The last one makes the most sense, fits the guns, makes the dedicated light infantry look and work ok while being easy to figure out because a base is a base is a base, seems to get the right effect for the cavalry while fitting my existing organization and just fits most of the terrain that I'm keeping and is easily accommodated when building more. Now, there were some quaestions about the balloons Lwrence made for me. Here's the upcomig airship as it arrived. The balloons are hollow plastic pumpkin Halloween decorations. The stem has been detached and the balloons spray painted. The double ones here are smaller than the single ones used for the observation balloons. The basket is made of a wooden base and frame with textured plastic basket weave. 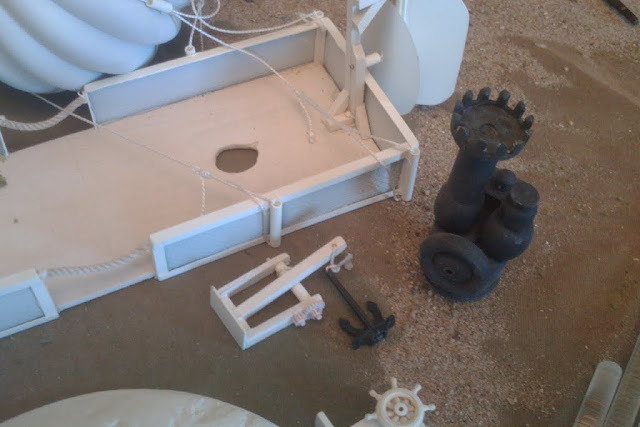 Small hollow plastic tubing has been cut and glued in place to guide the various rigging which is made of string. The base is wood with hollow brass tubing glued in place and spackle added to support the tunes and weigh down and beautify the whole thing. Elevation is provided by various lengths of translucent plastic which just fit the brass tubingand the neck of the balloon. Because this one has propoulsion, it has extra bits which are cobbled together from odd shapes of wood from a craft section, some ship model parts and various scraps. Oh yes there is also a rudder from sheet plastic. 1) Compliment Lawrence on the 28mm FPW Balloon he made for Mike. 2) Jokingly ask when he's going to make one for you. 3) Await delivery. Took about 2 years I think and delivery was 2 years ago........Good things come and all that. Despite appearances these are the NOT the armies of Faraway and Oberhilse but those of New Brunswick & Great Britain vs Maine & The United States of America. New Brunswick's York battalion supported by armed and angry lumberjacks has just pushed the opposing riflemen back from the first fence line. As I was clearing the table Friday night, I pondered George's offer to play-test a scenario if I was planning one to take to a convention in the US. Now this offer, typical of him, is a bit akin to offering to storm a machine gun nest single handed and similarly should really be accepted. The big problem was that while my twisted Aroostock War wargame has been registered with Huzzah which is only about 8 weeks away, it only existed as a vague idea. The opportunity was too good to pass up though so I set to it. The original idea was a British force moving up river and using a steam boat to bypass American defences (OK OK the very first idea was for an American invasion but it seemed downright rude to cross the border to set up a game showing my host making a non-historical invasion and getting whupped, not to mention winning...). So we have a British force seeking to reclaim its rightful property which has been unlawfully occupied. This leaves a lot of room so I started by considering some old favorite Grant scenarios which I haven't played for a few years. Immediately I came across a hitch, while I have yet to make a trip down the Aroostock (never mind visiting the Neverwaussie) other than via Google Earth, it seems to be similar to many river valleys in Maine and New Brunswick with rugged wooded hills to either side, only more wooded at the time since timber was the trigger point. Fine, first step is to settle the Neverwaussie valley and let the farmers clears some of the trees. This still leaves a narrow congested battlefield with the British advancing ALONG the river, the way all travel and expansion was done. So I laid out the river and thought some more. Finally I decided that there was only 1 road along the river, roads being in particularly short supply back then and in order to avoid some up river but off board terrain, it crossed the river at this point so the British advance was going to have to come up the road over the bridge and up the road again. Aha! An objective! The Americans would have a small force, mostly militia or volunteers guarding the bridge with US Army reinforcements on the way. The British would have a similar force arriving concentrated but with a pontoon bridge and a party capable of crossing the river. US Reinforcements arrive as does the HMS Reuse and British cavalry and artillery come into play. The river is a little narrow for my existing toy steam boat but in any event, I have gotten bolder and sillier as my dotage slowly approaches. Since Lawrence's response to my request that he make me an ("an" as in ONE ) observation balloon was to present me with 2 balloons and a steam powered airship (he ran across a sale on small plastic halloween pumpkins - look carefully) and since Steam Punk/VSF stuff still seems popular these days and this is a war that never happened being fought with glossy toy soldiers, I decided that I should replace the steam launch with an airborne assault. Of course the airship isn't painted yet so it was back to the hastily scratchbuilt HMS Reuse for Saturday. It did seem only fair to give the Americans something vaguely steam-punk-ish as well so decided on a steam driven battery. Its not built yet either so I used a mortar in a wagon pulled by my steam tractor. I may or may not do better on the day. Some boiler plate armour would be good at the very least. I also figured I may as well upgrade the morale on the State and Colony militia so have granted "regular" status to anyone with a uniform with real regulars getting Elite status and any local Volunteers being boosted to Irregular Light Infantry. Clearing the shelf, I fielded 2 New Brunswick battalions (there is a constant temptation to call them Canadian but New Brunswick was not part of Canada at the time ) and 3 British ones, all of 3 stands or 450 men due partly to congestion but also with a nod to 1812 and Mexican War field strengths. I also brought out some riflemen and irregulars but was unsure how to organize them so offered George some choices. He took the one of having each stand be a unit, so 3 of irregulars and 4 of regular riflemen. He also broke the Dragoon Guards into squadrons since there was no room to deploy the whole regiment in line anyway. I only have 2 of the KDG painted up so the 5th or Princess Charlotte's took their place. Two field guns rounded off the land forces while the HMS Reuse carried 3 stands of light infantry (the sailors are not molded yet let alone cast and painted so I used 1812 Canadian militia,sighh, I have a LOT of work to do!). After some bickering over precedence of State vs Federal officers, the US started off with 6 stands of local "irregulars", 1/2 with rifles on the British side, the rest and the Lafayette County Rifles (musket armed line infantry) on the American side. Off table was a regiment of Dragoons, 2 x 2 stand units of rifles and 4 battalions of infantry, all cavalry and line troosp being 3 stands strong. A light howitzer and the steam battery rounded things off. I rolled for arrival of troops but part way through decided to re-neg on the 2nd brigade of infantry. On the day, I think I will hold them in hand as GM, only committing them if the game threatens to end early due to lack of American troops. Somewhere around turn 7 or 8 the Observation Balloon has gone up giving the British a +1 on their initiative roll, not that they needed it. The York battalion is now assaulting a stone fence but have met with stern resistance. One of the dangers of staging a game for 6 strangers is that it can be hard to predict how they will interpret what you tell them or how they will choose to tackle the situation. I didn't have 6 strangers but I had George and his plan caught me off guard. Instead of putting the landing force ashore to cover the building of the pontoon bridge at the earliest opportunity, he chose to push up the river and secure that bank before launching the new bridge 1/2 way up the table and only landed the covering party at the last minute. If I had brought on all of the American reinforcements as planned, they would have had time to meet the bridging crew with overwhelming force but that's why we play test. From what I understood of George's plan as described to me later, he had led with the smaller brigade composed of New Brunswickers with the intent of just screening that flank while the crossing, at what appeared to be the optimum spot, was to be done by the British Regulars screened by the landing party. C Squadron of the Dragoon Guards thunders over the bridge, throws back the counter charging US Dragoons and over runs the steam battery. The game progressed smoothly enough with the British troops pushing back the American skirmishers who rallied and massed behind a stone wall reinforced by the line battalion. At this point the lumberjacks tried to trade long range musket shots with close range American rifle shots. Since that wasn't going well, the York battalion was ordered to charge but baulked even with the brigadier trying to haul them forward by their collars. Eventually they got the message but ran into a handful of 6's from the riflemen and were forced into a close range firefight. It took a 2rd effort to finally clear the stone wall but by then the battalion ws well below 1/2 strength and was soon destroyed as a fighting unit. The 49th Foot was brought forward to take their place. Closer to the river, American reinforcements had arrived and were jammed up without space to deploy. The brigade's riflemen crossed over and deployed only to be chased away by cavalry. The 1st infantry got most of the way over the bridge and then froze. Eventually the brigadier was able to beat the front companies off the bridge and into line just as the cavalry rode into them (opportunity charge). Thanks to the Brigadier they managed to repel these by the skin of their teeth. After freezing again, and then having the brigadier hit by artillery fire, they finally gave up and retired pellmell across the bridge before the next squadron of cavalry could charge them. 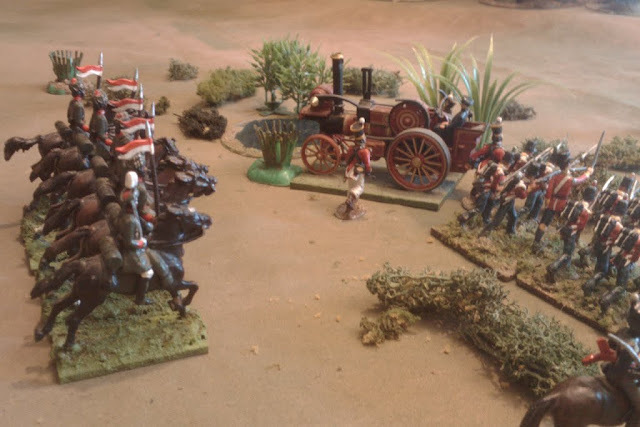 The cavalry thundered over the bridge despite a blast of canister from the light gun, met the US Dragoons galloping forward to meet them, brushed them aside and pursued into the steam battery. Despite appearances, this was treated as an armoured target thus they needed a 6 to get 1 hit, they did, the battery missed its shot and was over run. Oh well, no wonder these contraptions didn't catch on. At last, as the fighting continued on both sides of the river (irregulars vs landing party on the American shore), the pontoon bridge was finished and the Young Buffs crossed over. Time was up however, the road wasn't clear yet and the British, having lost 13 stands& leaders were 2 away from their Army Morale break point while the US had only lost 4 stands. A clear US victory. Light fades as the bridge comes into play. British losses have been heavy and another brigade of US troops can be seen approaching. Its time to call it a day. It was an enjoyable game but it also provided good feedback and food for thought. There were fewer troops than initially planned but the the table was crowded and despite the fast play rules, there were enough units to make the game last through the time limit and then some. The crowding and the (relatively) long delay between the British arrival and the first serious fighting was a concern given the short duration of convention games. Its good to have a bit of time to adjust to the rules but not too many, especially if it means reinforcement commanders are kept kicking their heels. I had originally planned on a 6' x 10' foot table as used at Cold Wars and such as I used to have 10 years ago. This would have allowed all of the British to start on table and for US reinforcements to arrive earlier even if players are just advancing uo the road for their first move or 2. I understand that the standard tables at Huzzah are going to be about the size of mine which is actually pretty handy for planning and big enough for this sort of game. The first step is going to be to turn the game sideways, the second will be to deploy the British about a foot on table, including the Pontoons and the boat if I use it (depends on what I get done). I was going to remove the Pontoon wagon forcing the British to build it near the table edge but then I remembered that it was about turn 3 before George brought it on and then he trundled forward cross country for several turns. I will run the road close to the river and this plus having the pontoons start on table should allow the British to choose the placement and their strategy but still get the bridge built by mid game thus giving the Americans a target for a counter attack before the British can build up their forces on their bank. The use of single stand skirmish and cavalry units was interesting but now I am stuck between horses. I do want to go the same way on both sides and in the 1812 - 1840 period in North America squadron sized cavalry units and small skirmish units make sense but do I go with 2x2"/2 figure troop stands or a single 3"/3 figure squadron stand? In the mini campaign I used 4x2man cavalry stands as a regiment but planned to use 3" squadron stands for this game. As George points out there was no room to deploy regiments and the same will be true of 1812 (yes I'm probably going there with HofT after all). Two stand units allows the normal rules for hist and rallying to work more seamlessly, would allow for squadron columns and give more hitting power than a wider stand. It also means 4 figures instead of 3 from a visual POV but I will have to revisit what it means for my collection going forward and look at what regiments will be. Theoretically, a 3" wide stand would be right if tight for a 150 man squadron which is strong for campaign strength but still not up to paper strength. A 2" troop stand is really a bit too large but I think I can work with it. I'll have to do some playing about. Did I mention I have a BUNCH of casting and painting to do over the next 6 weeks? The Brown Shields move rapidly to surround the post while the Black Shields move up the middle from their position in reserve. Most of the White Shields have either "gone to ground" behind whatever cover they can find or are lying wounded on the field. Once the witch doctors had rattled the bones and determined the appropriate sacred deployment of the Prince's army, the battle progressed quickly. The long range fire from the relatively large number of Nku Khu firearms was no more effective than could be expected but every now and then a shot got through and the slow drain on the Scots was soon getting worrisome. The first charge provided a tense moment as it looked like the center section of Highlanders was going to be defeated and forced to retreat leaving a hole (they took 1 hit and inflicted none) even though the White Shields as a whole were also defeated having taken 3 hits and only inflicted 1. Luckily Lt. Caine had joined them and came through. The White Shields fell back behind their skirmishers but had trouble rallying until they voluntarily pulled back out of sight of the British. Their poor riflemen tried to keep up the fight but were unable to rally and were eventually eliminated one after another. The Scots, with 3 hits now, also had trouble rallying despite the Pipes and MacDuff was forced to pull them back to a safe spot and bring across fresh troops from the other side. 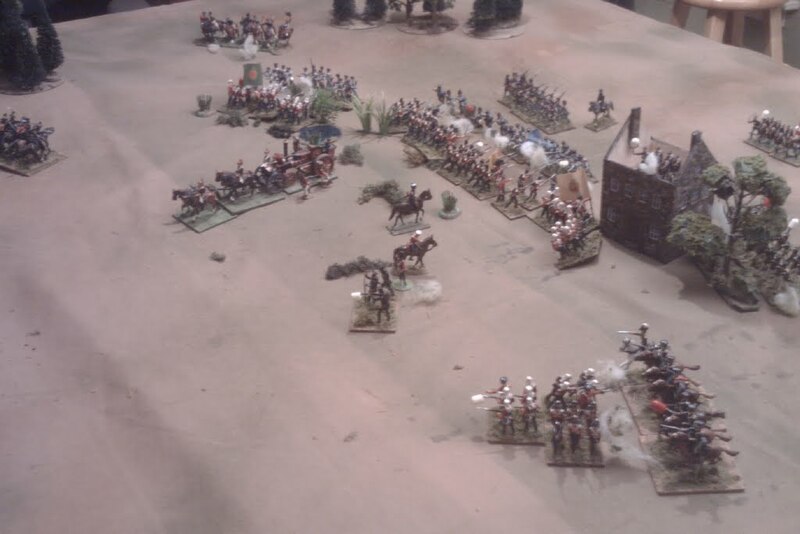 The Brown Shields moved around and charged the far wall which had been left momentarily undefended but the Scots got a section their just in time. A devastating volley was followed by some equally devastating melee dice against an almost complete whiff and the Brown Shields drew back to the board edge to rally. They should probably have gone farther but rallied well. The next volley brought down their leader and they milled in confusion long enough to be almost completely destroyed by rifle fire. That left the Black Shields. They moved up the middle and renewed their attack on the wall. Led by their Chief they rushed in and inflicted 3 hits on the poor replacement section. It must have been a weak spot in the wall! These had already been hit by fire and were removed. The first British stand loss of the day. The over all result was a tie though so the Black Shields fell back an inch, ready to renew the fight on the next turn. Before they got a chance to do so, MacDuff brought the Volunteers across at a run and a rapid and effective fire reduced the Black Shields by a stand bringing the Nku Khu Army morale to 0. The first wave was repulsed. The QM is keeping track of ammo issued from his stores to the garrison. The defenders only lost 1 of their 7 stands but 2 others had been nip and tuck with 3 hits and only poor shooting ability and good rallying during a brief respite saved them. If they had lost 3 stands, I doubt that they would have had any chance of repulsing the 2nd wave. As it is, the game is still in the air. The rules worked well despite the low level of the game. It was fast paced with just enough to do and some tension at several points. Having the figures as singles rather than based was neither here nor there though I did catch myself occasionally thinking that having 1/3rd the number of bases of Nku Khu to move might be nice although that would have to be balanced against the ease and fun of knocking them over. It was nice being able to play a game without thinking, "I need a 100 more Zulus".... MacDuff is actually a little worried about all this. The only down side is that I am now wondering why I want to do 40mm native spearmen when I already have these? Needs some thought but the time might be better spent refurbishing the old Britain's including some Brits in helmets and adding some more Nku Khu based on my one original Britain's Zulu, fixing the bases, painting up some NKMP and so forth so that it is already to go when I get a Colonial itch. An overview of the end of the first wave. the White Shields have rallied in cover and despite heavy losses were working their way around to a weak spot when the command came to retire. Alas, the British relief force is approaching and the Nku Khu have been forced to call off the attack.